The world of big data and cloud has accelerated us into a world of relentless data generation and change creating turbulence between the physical device layer and the upper storage services. Enmotus’ Storage Device Virtualization software provides you a simple method for interfacing between these layers while providing the unique ability to see your storage device behavior, as well as act upon their dynamic data pattern changes in real time. Why store your inactive data on flash? Blend performance and capacity storage into an automated virtual volume. The size of the performance tier and the capacity tier can be scaled independantly to meet your individual requirements. See inside your storage in ways you never imagined. A data intelligence engine tracks all IO activity. This information is used by the system to make decisions in real time on what data to promote or demote to/from the fast tier. 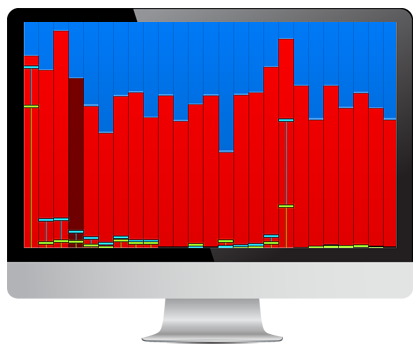 Visual monitoring tools allow you to see the reads/writes and their locality in your volume, making it easy to validate the system is properly optimized. Match dynamic application and virtual machine need in real time with automated policy driven decision engines. The MicroTiering™ engine continuously balances the volume to guarantee that the system is operating at peak performance without the need of user intervention. Manual pinning capabilities allow you to lock select files to either the performance tier or the capacity tier.